This will be held in the main hall in the Whanganui War Memorial Centre, Queen's Park, 2 Watt Street, which is in the heart of the city. The hall will be set up on the Friday morning. On Friday afternoon between 4.00pm and 8.30pm both members and non members of the Society are invited to bring their blooms along from their garden and enter them in the Novice Class. And also on the Saturday between 7.00am and 8.30am. Indiviual bloom classes are in their prime colours of white, pink and red, and variegated, and/or in groups of three either in the same colour or in different colours. They can be of any species and they do not have to be named, but name if you can. Stewards will be available to assist you to enter your blooms. 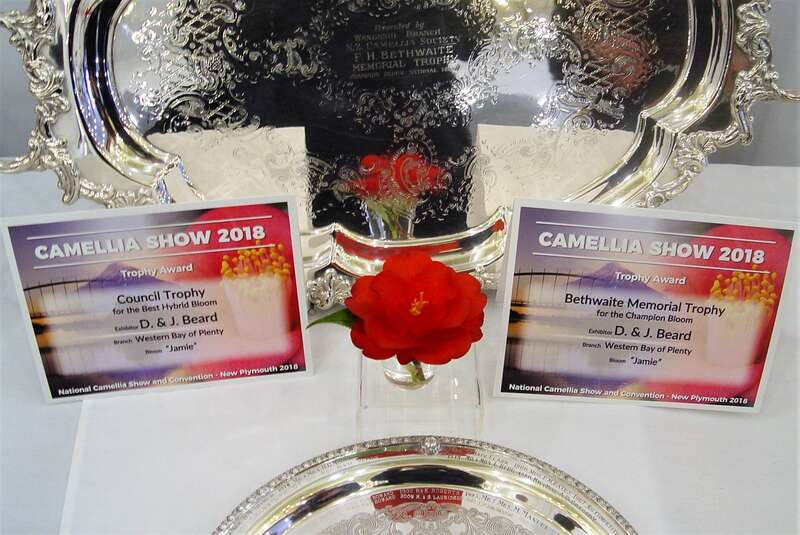 In each class the judges will award first, second and third places, and the best bloom overall will be awarded as the Champion Novice Bloom along with a trophy. All classes will be judged between 9.00am and 11,30am including those that are deserving of higher honours. On Saturday afternoon the show will be opened to members of the public from 12.30pm until 4.45pm. The blooms will present a sea of colours in differing shapes, sizes and species in their different classes. 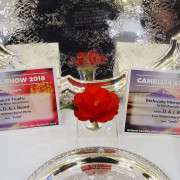 There will be a "top table" and this will display the Champion Bloom of the Show, the Best Novice Bloom, and those blooms who won their classes along with their trophies. These will be the best blooms. In addition there will be a number of "Honour's Blooms" on display, and these are the ones that didn't quiet make it to the top level. There will be an entrance fee of $5.00 per person; children are free. Derek and Jenny from Western Bay of Plenty won a total of ten first places in different classes including trophies and certificates, as well as four seconds, and one third. .
Alan from North Taranki won a total of five firsts, two seconds and a third in different classes in the Novice Classes. 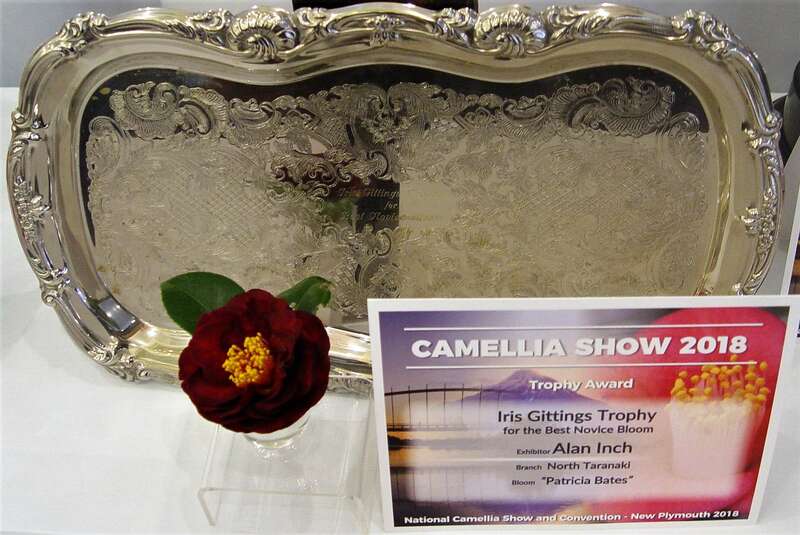 When you make contact make sure you say you are part of the Camellia Group. 1 The EconoLdoge Motel, has 28 rooms at $125 for 1 or 2 people with an additional $20 for each extra person. There are rooms on the ground and first floor with access to the first by stairs. These are economy class. 2 Quality Inn Hotel 27 rooms at $144 for 1 or 2 people with an additional $20 for each extra person. Rooms are on the ground and first floors with a lift available to the first floor. These are quality rooms. Friday and Saturday it is either continential at $13.50 per person or cooked at $20.00 and this could vary depending on the order. Sunday and Monday it is only continential at $13.50 per person.